Isn’t this a cute ekaki-uta? March 3rd (this Saturday) is Hinamatsuri (Girl’s Day) in Japan. 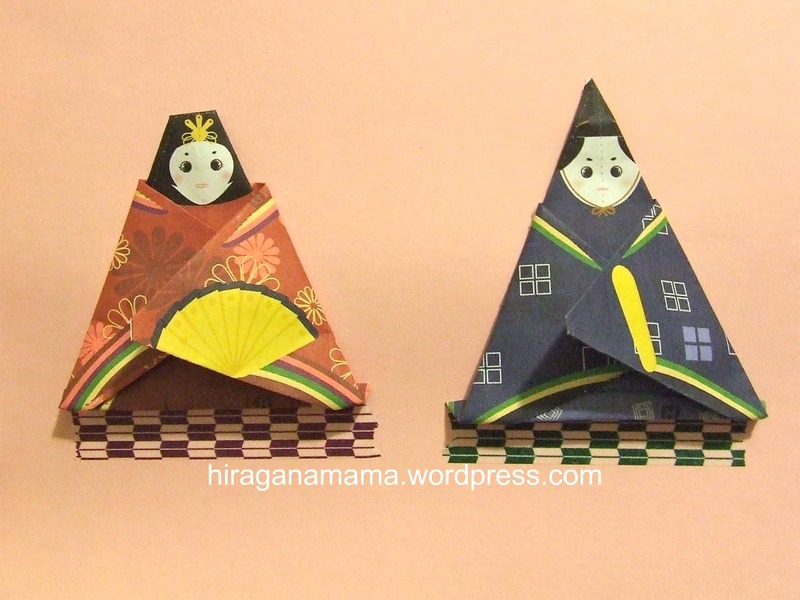 Read my post from 2011 for ideas on how to celebrate ひなまつり! I was craving mochi so I used this mochiko recipe from Cookpad (Cookpad is the equivalent of America’s “Allrecipes”). It was easy to make and my kids gobbled it up! P.S. I am sorry I have been slow about responding to emails and comments. We had a family emergency this weekend and I am still recovering from our whirlwind trip… 5 planes in 3 days! I feel like I have been run over by a shinkansen :). The good thing is, I now feel more prepared for our long plane ride to Japan. I’ll be posting about what I plan to do to entertain my kiddos for 17 hours on the plane soon! Today is Hinamatsuri/Girls’ Day! How did you celebrate? We ate ichigo daifuku and sushi, looked at my friends’ hina nigyou display, and made hina ningyou out of origami (shown below). I hope my little girl will grow up to be healthy and marry a nice man someday (that’s the hope behind displaying the hina ningyou)! Don’t forget to check out my hinamatsuri post for TONS of things to do! 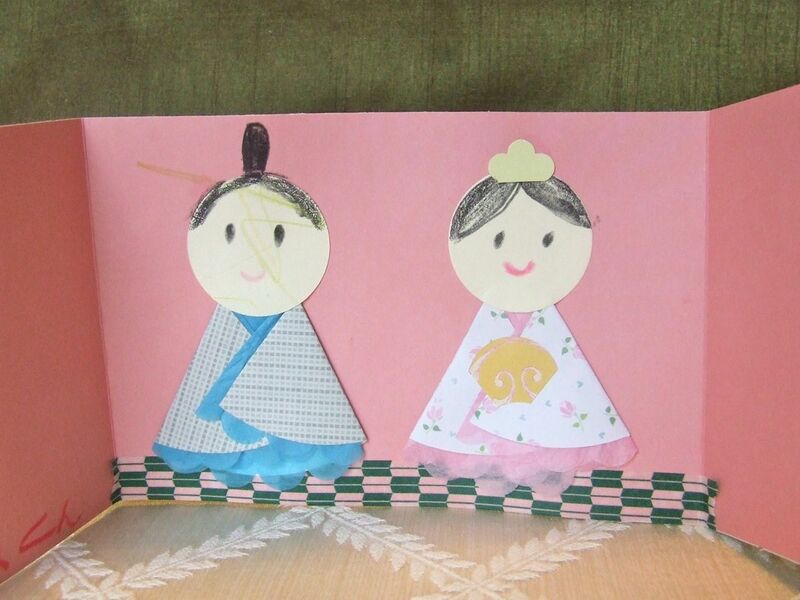 1) Cute, cute hinamatsuri card to print and color at KF Studio. 2) Shimajiro.co.jp has printable activities perfect for spring (including hinamatsuri, graduation, a calendar, and kisekae). 3) GREAT in-depth article about the symbolism behind Hinamatsuri and Hinamatsuri food at The Japan Times Online written by Makiko of JustHungry.com. 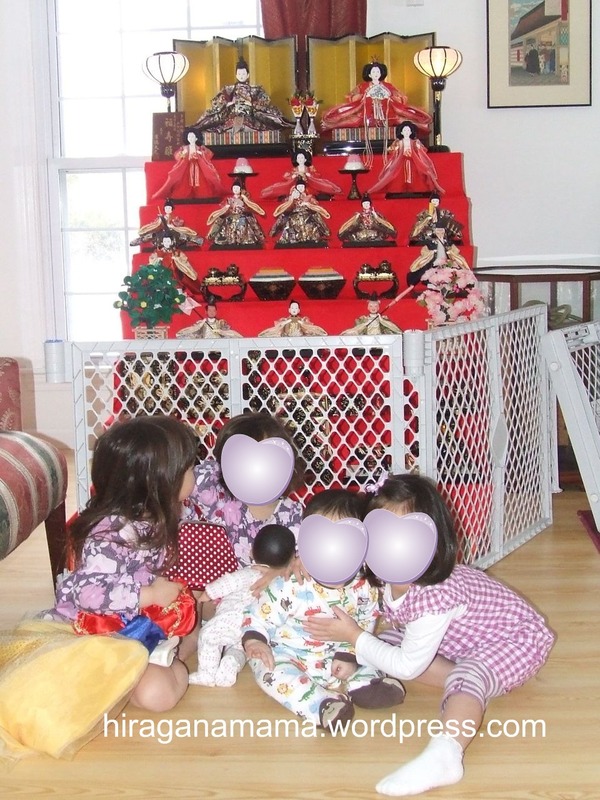 I am sooo excited that Hinamatsuri (ひなまつり）is coming up in a few weeks! In English, it is called the “Doll Festival”. The date is easy to remember… 3/3, March 3rd. (Children’s Day is 5/5, also easy to remember). My mom always got out the hina dolls (ひなにんぎょう) around this time of the year. I always thought they looked really creepy (see an example here), but apparently, they help drive out bad spirits. My mom always took them down as soon as Hinamatsuri was over. There’s an old wives tale that says the longer you keep the display up after the holiday is over, the longer it will take for your daughters to get married. Well, I guess it worked, because I got married at the very average age of 25! It is also customary to eat pretty food like chirashi-zushi, strawberry daifuku, hishimochi, hina-arare, and ushiojiru. Man, I am craving ichigo-daifuku so bad right now! I may have to make them soon! 1) Kids@NIFTY: Crafts, recipes, games, coloring pages, etc. 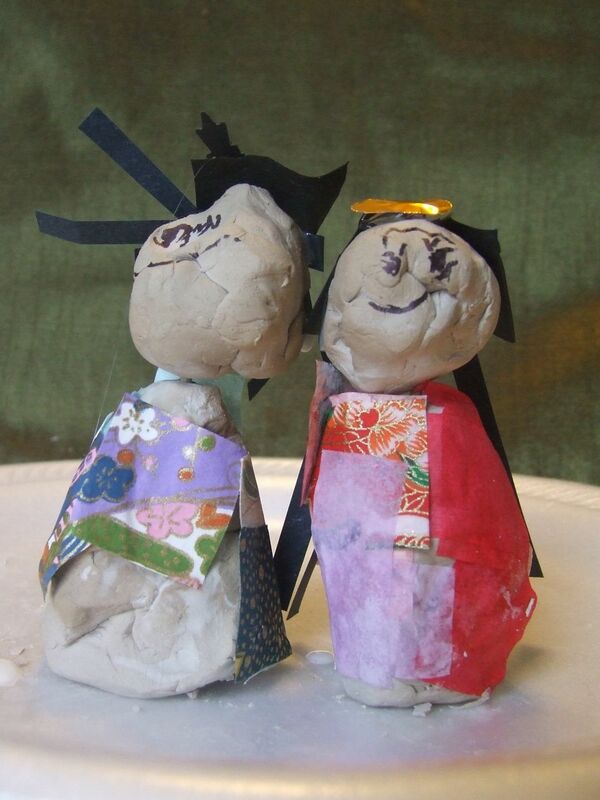 9) Hinamatsuri.com: The name says it all… all kinds of Hinamatsuri printables and crafts! 1) Here are the lyrics (and melody) to the song, “Happy Hinamatsuri” 「うれしいひな祭り」from Amic Co., Ltd.
2) AWESOME! There’s a new Hinamatsuri album you can buy on Amazon.com called “Ureshii Hinamatsuri: Songs for Japanese Doll Festival / Girls Day／うれしいひなまつりベスト“- 99 cents per song or $8.99 for all 20 songs! 2) I really want to make these Hinamatsuri candies from la Fuji Mama this year! And if those aren’t enough resources for ya, there’s TONS more at koos.com that I don’t feel like clicking through right now. If you look at all the links and come across a great one, please share with us! Check back on this post next week because I’ll keep adding resources as I find them. Yeah for GIRLS! 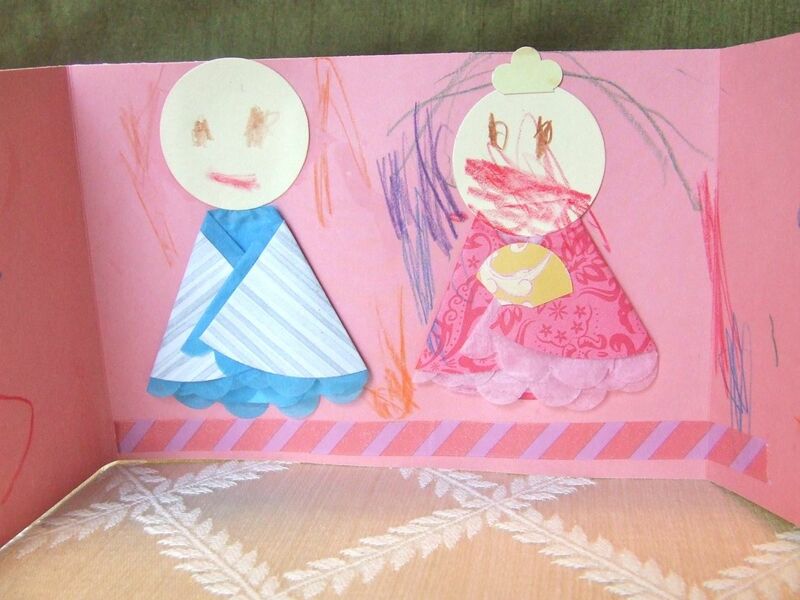 I found another adorable hinamatsuri craft for your kids (see image above). Click HERE for the printable, and HERE for the instructions! It’s almost spring! Spring in Japan means Hinamatsuri (Girls Day), Kodomo no Hi (Children’s Day), cherry blossoms, graduations, beginning new classes, etc. It is a wonderful time of year. Our family has been very busy lately with new jobs, birthdays to celebrate, etc., so I am sorry for the sparseness of new posts. Hopefully I will find the time (and motivation) to blog again soon. In the meanwhile, enjoy this YouTube video from “Pitagora Switch for Adults (大人のピタゴラスイッチ)”, that can also be enjoyed by children. You can also follow me on Pinterest! Have a wonderful weekend :). 1) Wash and dry strawberries. Remove stems and cut the berries in half. 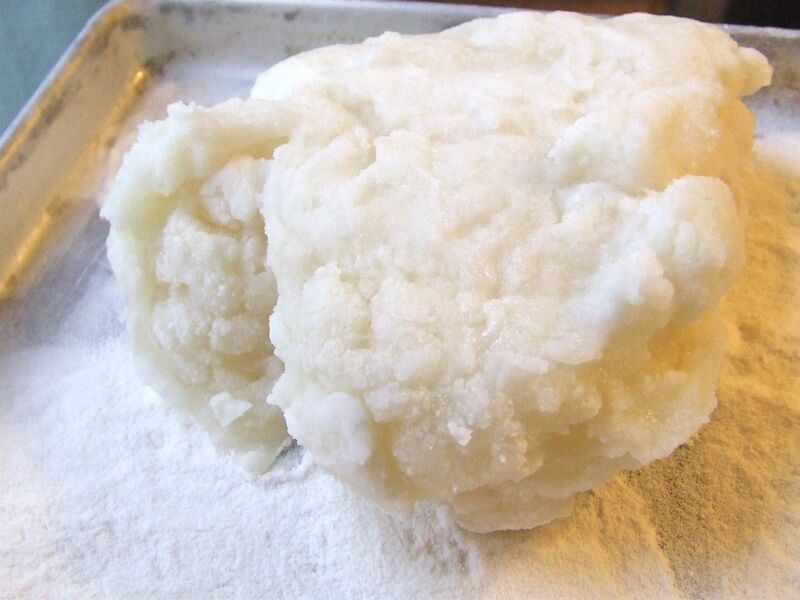 2) To make the mochi: Stir together the water, granulated sugar, and mochiko in a microwave-safe bowl. (ad a drop of food coloring if you’d like). Mix well. Microwave on high for 2 minutes. Stir well with a spoon. 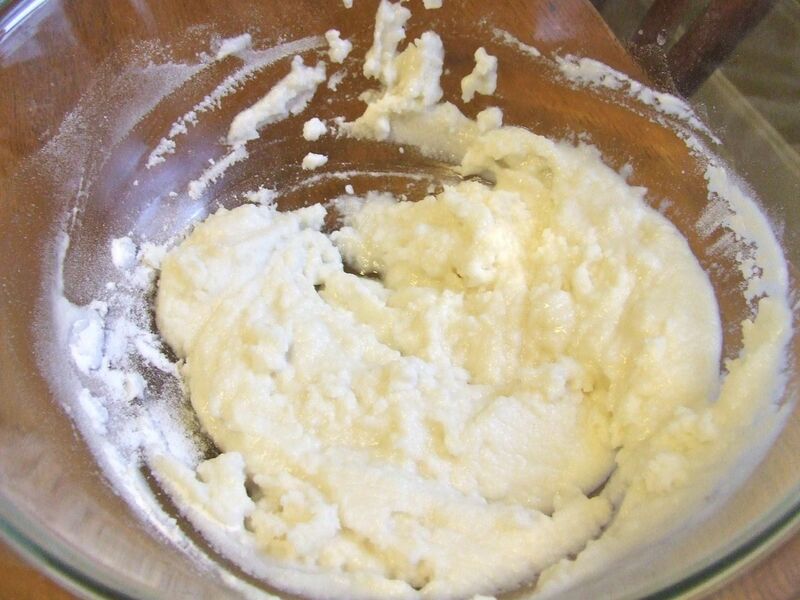 Microwave an additional 30 seconds, or until the mixture can be formed into a soft ball. 3) Dust a surface with the cornstarch and powdered sugar. Dump the mochi mixture onto it. 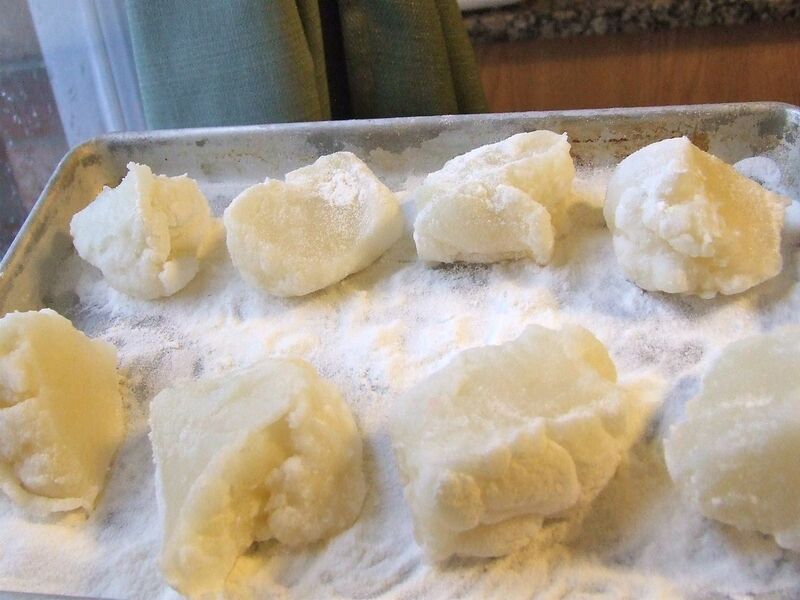 Use kitchen scissors to cut the mochi into 8 pieces. 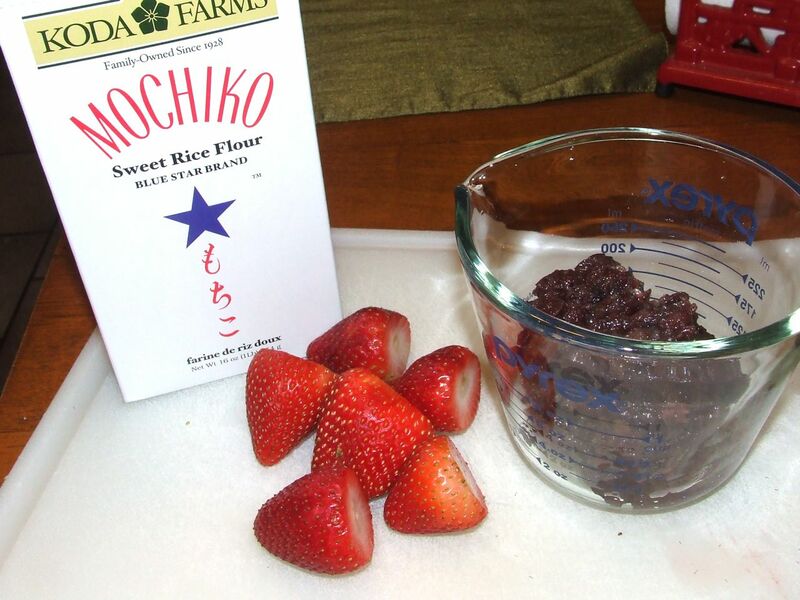 5) Put a teaspoon or two of anko in the middle of the mochi, then place a strawberry on top. Gently wrap the mochi around the strawberry, being careful not to let the mochi tear. Pinch the seams closed. 6) Roll the daifuku in the corn starch/powered sugar until it’s not sticky to the touch. 7) Eat in the next few hours! Don’t refrigerate- they will become hard. 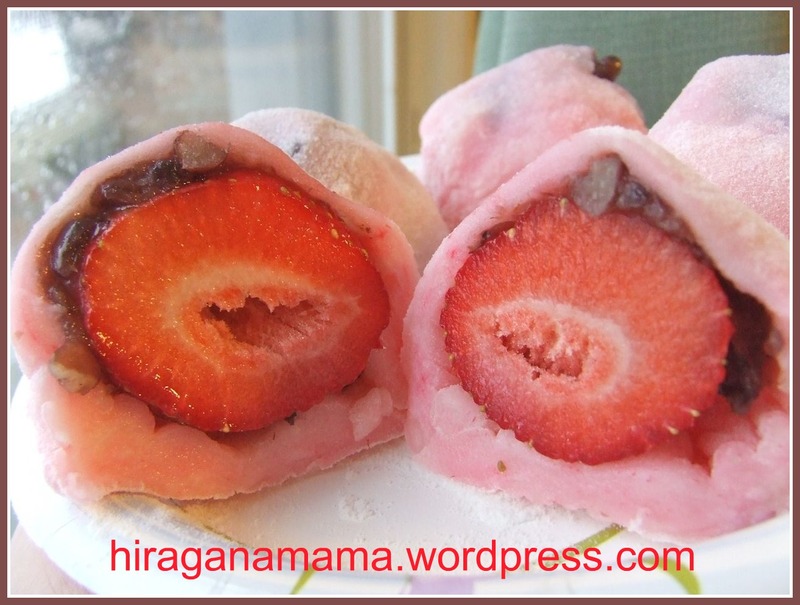 I made ichigo (strawberry) daifuku in honor of Girls’ Day/Hinamatsuri. 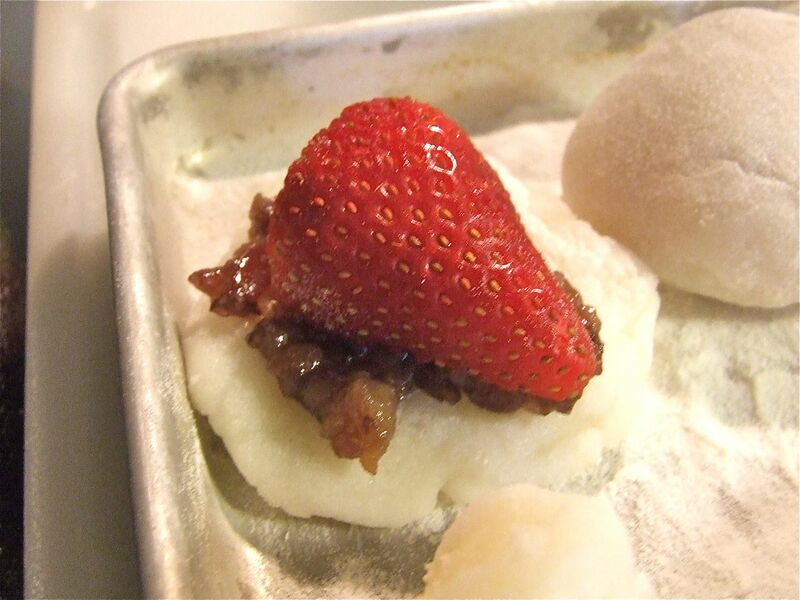 Sweet mochi, strawberries, and anko… yummy! I’ll take you through the process of making these things. It was my first time in awhile so I made some mistakes and learned from them. Here are the main ingredients for ichigo daifuku. If you live in an ethnically diverse area, chances are good that your local grocery store will have mochiko in their Asian section. If not, I would try an Asian grocery store. I made my anko from scratch using azuki beans BUT I highly recommend taking the shortcut and buying premade anko paste. Making it from scratch was time-consuming! You’ll want to get all your ingredients ready before you begin. Have your strawberries washed, dried, and cut, make the anko, etc. Once you begin, you can’t really take a break in the middle of this. I followed the ichigo daifuku recipe from About.com (I didn’t follow it exactly though). Then I used kitchen scissors to cut the ball into 8 pieces. They weren’t all exactly the same size, but that was ok because my strawberries were all different sizes too. I dusted my working surface with mochiko because I didn’t have any katakuriko (potato starch). The mochiko has a funky texture though, so next time, I think I will use a corn starch/powered sugar mixture instead for a softer feel. Let these rest for one minute because they are REALLY hot straight out the microwave. But you’ll want to start wrapping the strawberries as soon as you can handle them, otherwise, they will get too hard. Then I flattened each piece, stuck a small spoonful of anko in the middle, placed half of a strawberry on top, then stretched the sides together to form a ball. Don’t flatten the mochi too thinly or it will tear and not look pretty. (Also, I learned that smaller strawberries are better. The bigger ones were hard to wrap). 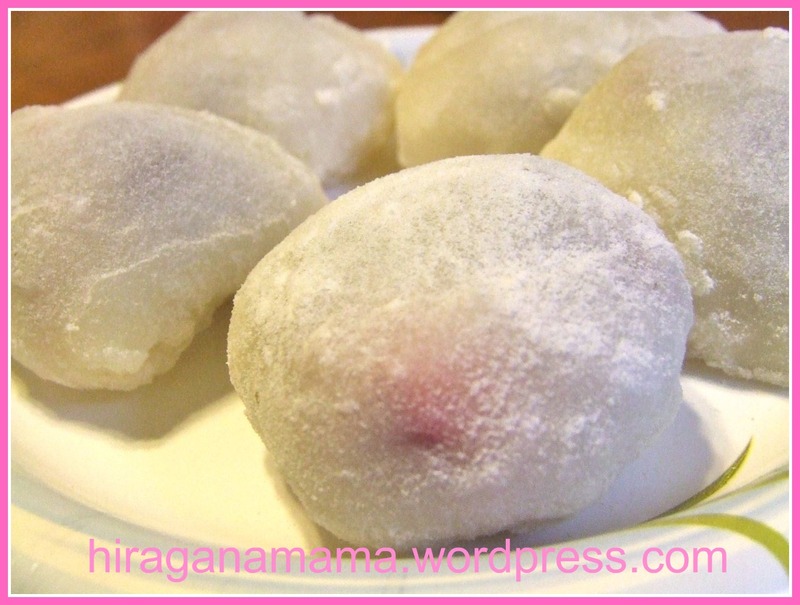 * Add a drop of red food coloring before microwaving for pink daifuku. *Une-Deux Senses made very pretty green tea-strawberry daifuku here. 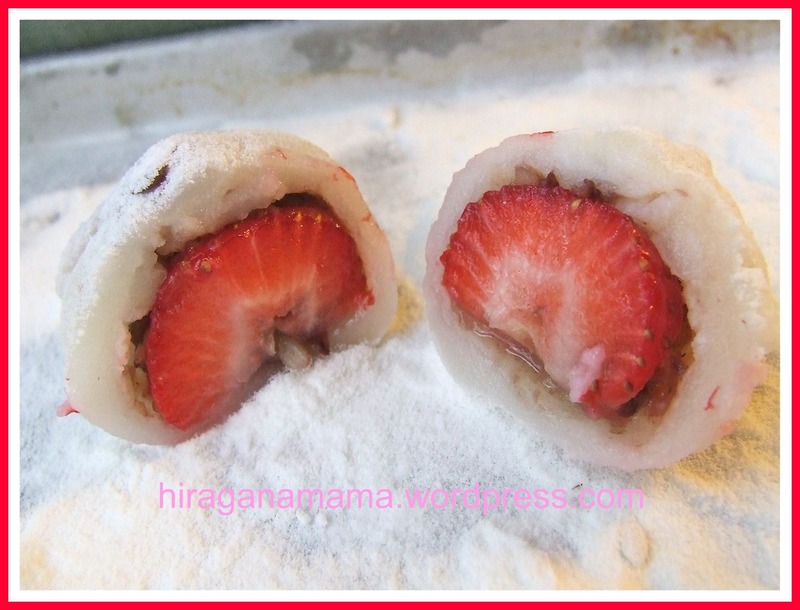 *Instead of anko, dip the strawberries in white chocolate then wrap in mochi. 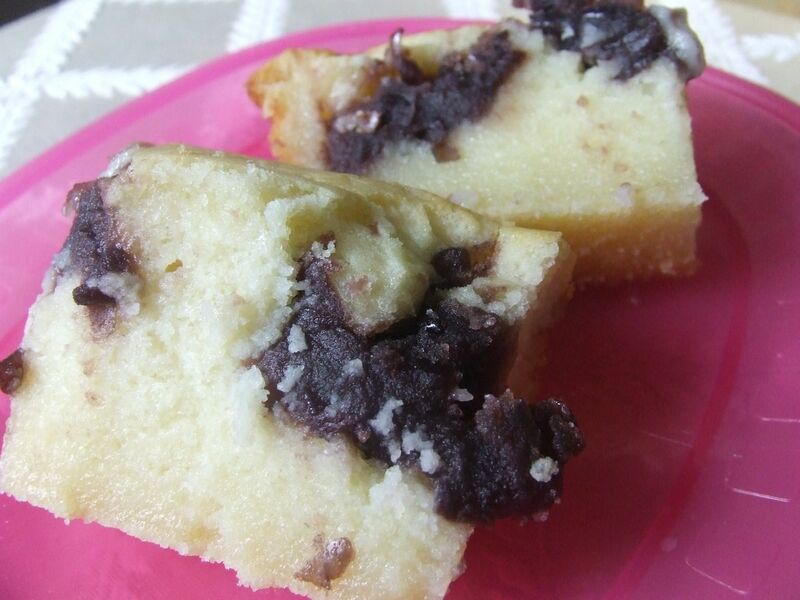 * Instead of anko, put strawberries and Nutella inside. * Use a different fruit. I’ve done raspberries+white chocolate before, and it was AMAZING. * If you work quickly, you could wrap some ice cream inside the mochi for mochi ice cream. MMM. I’m off to a Hinamatsuri Playdate now, but I will post the full recipe for you later.